An environmentally focused event, ‘A Greener Bradford’ was held at BOA’s Holy Trinity on the 8th September with the aim of organising an interactive, inclusive community forum on Climate Change and how we can all lead more sustainable lifestyles. The Revd Canon Joanna Abecassis welcomed everyone before the event was officially opened by the Mayor, Cllr Alex Kay, who spoke on many of the Town Council’s initiatives including progress on a project looking to install solar panels at St Margaret’s Hall, supporting ‘Plastic Free Bradford on Avon’ and how we are making smaller sized allotments available at Sladesbrook and Bancroft. With more of the community growing fruit and vegetables, allotments not only help keep food miles down but also help to sustain wildlife habitats and help keep biodiversity levels buoyant. The speakers were Michelle Donelan MP and Rt Revd Nicholas Holtam, Bishop of Salisbury, the lead Bishop on the Environment for the C of E who both gave very informative talks. Michelle talked about the need for reducing plastic usage and Bishop Nicholas praised the town for holding such an event and securing the attendance of our local MP which in turn may enable concerns to be taken back to Parliament. A lively Q and A session followed both speakers. 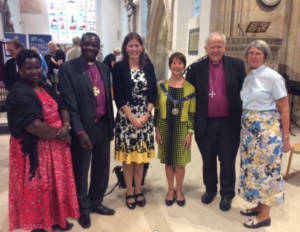 Organisers were also thrilled to welcome Archbishop Justin Badi Arama, the new Archbishop and Primate of South Sudan and his wife Mama Joyce who gave an enlightening speech on environmental issues facing South Sudan. The event showcased an array of local sustainable lifestyle exhibitors, who provided information and advice on many areas in which people can help to make a difference; analysis of carbon footprints, sustainable home building and lifestyle choices, as well as information about electric vehicles and encouragement of carbon neutral activities. Wessex Water provided visitors with refillable reusable water bottles. The event also hosted a community lunch, the ingredients of which were all organically grown and locally sourced, over which more discussion and idea swapping ensued. Many thanks to Jane Jones of Holy Trinity Church for organising the event, supported by the Town Council, and if you would like to find out more about any of the issues above, please get in touch.